There’s an inside joke amongst beekeepers that if you ask n number of beekeepers about some aspect of beekeeping you will get n+1 different opinions in response. Each beekeeper has their own notion of what is best and there’s usually a new idea floating around on any given topic that beekeepers have heard about but haven’t yet tried. There’s so much passion and love amongst beekeepers and it is clear to me that most beekeepers want to do what is best for their bees. But what is best? Some beekeepers aim to keep their beehive free of synthetic chemicals in the belief that it is best for the bees and the people that consume bee products. 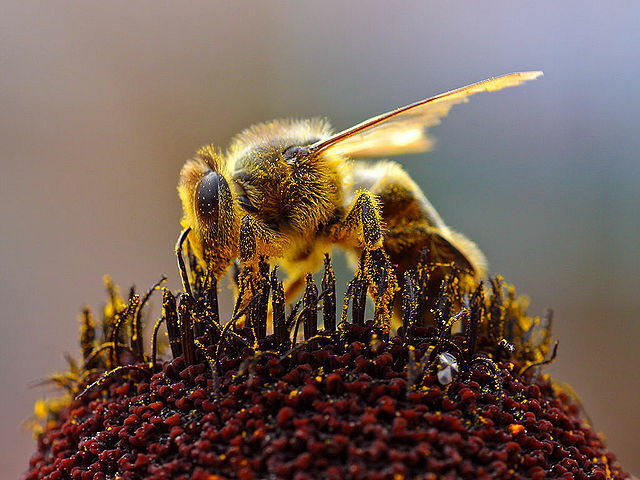 Some beekeepers feel it is in the best interests of the bees to treat their ailments as effectively as possible (which includes the use synthetic chemicals) in order to give their bees the best chance to survive the winter and they think it is cruel to let the bees die when there are treatments available. In my reading Top-bar hives appeared to be better for bees than Langstroth hives but I’ve recently heard from a local beekeeper, Kurt Streckeisen, that Top-bar hives don’t overwinter well in Ottawa’s harsh climate (we have a mean daily temperature in January of -10.32*C and occasional dips down into the -30*c range1). He explained that when it’s really cold out it becomes difficult for the Top-bar bees to travel below the comb to access their honey reserves. Bees in Top-bar hives can’t travel above the bars to move laterally through the hive whereas Langstroth hives allow bees access to space above the comb. Hot air rises so the top of a hive is actually slightly warmer than the bottom of a hive and those couple of degrees can mean the difference between survival and starvation. Who is right? How can I know for sure what is best for my bees? Making sense of all of the conflicting information from the multitude of sources is a daunting task and perhaps one beyond a newbie like myself. The method I’m going to put into place to deal with this lack of certainty will be to experiment, systematically log reams of data, and determine using statistical analysis what works best for my bees over the long-term. So much of the information going between beekeepers is anecdotal and I’d like to bring a little more data into the Eastern Ontario discussion. To counter-argue, in a vertical hive the bees will sometimes climb up the middle without feeding on the honey in the outer frames, hit the top, and then starve. Hive geometry no doubt makes a difference but bees trump all. Some beekeepers (langstroth and otherwise) use a sharp knife to make a sort of central tunnel through comb. The bees can then travel between sheets without approaching the colder perimeter. If they have a mind to, of course. This entry was posted on December 10, 2013 by beewhispers in Bee Research and tagged apis mellifera, bee, Beekeeping, Langstroth Hive, Ottawa, Top Bar Hive.